Row 2: turn, DO NOT CHAIN, 1sc in each stitch across until the end working in the BACK loops only. 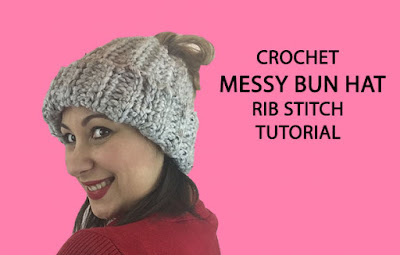 Row 3: chain 1, turn, 1sc in each stitch across until the hair elastic, working in the BACK loops only, 1sc into the hair elastic. In the end of row 34 cut the yarn leaving a long tale and finish your work. 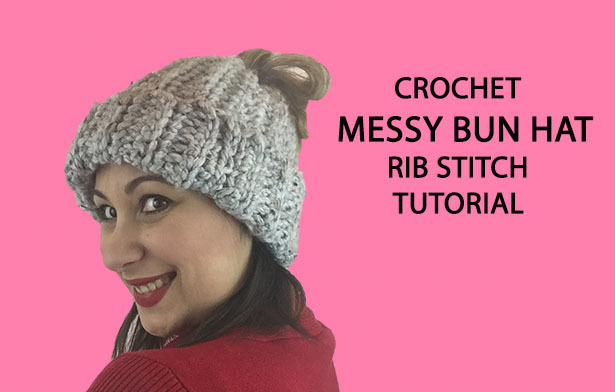 You can watch our video tutorial witch shows you how to crochet this beautiful messy bun hat step by step.